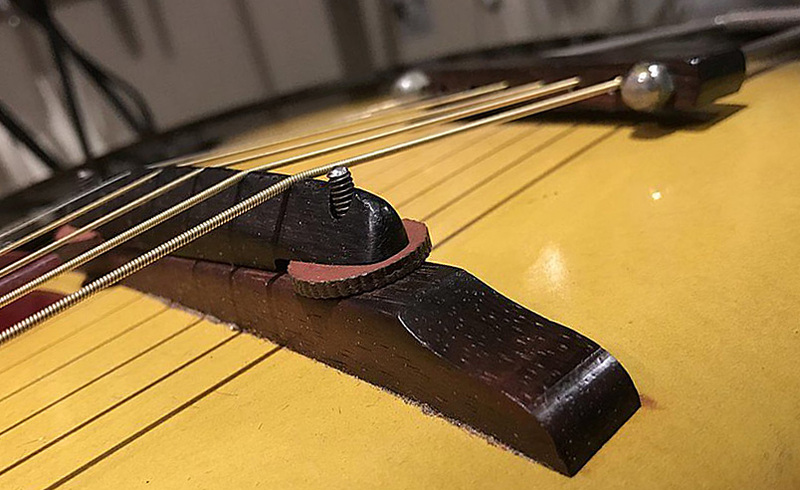 Let's look at the bridges Epiphone used on their archtop guitars over the years – the type also called "floating bridge" because the unit is not fixed to the top of the instrument, hold in place just by the downward pressure of the strings. 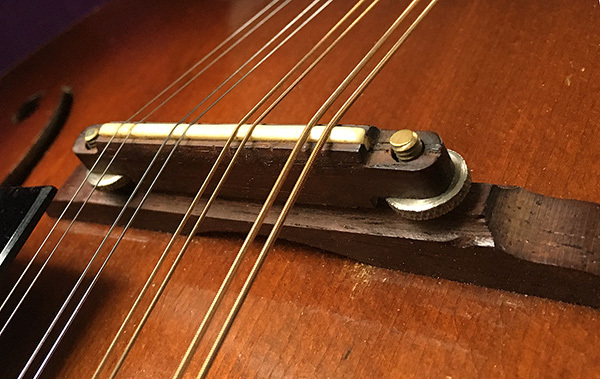 Epiphone's bridges are based on the design principles introduced and patented by the pioneering archtop guitar/mandolin company, Gibson, in the early 1920s – featuring a base part with separate top, height-adjustable via thumbwheels on threaded posts (see picture below). The bridges used by Epiphone show some characteristic design features which underwent a number of changes between 1931 and 1956. This overview may help to determine if a bridge in question is an original Epiphone part (or not), and also to identify the period of manufacturing. A big thanks to Anthony Hendrix, Ruurd Feitsma, and others who have discussed the topic and provided some of the images! 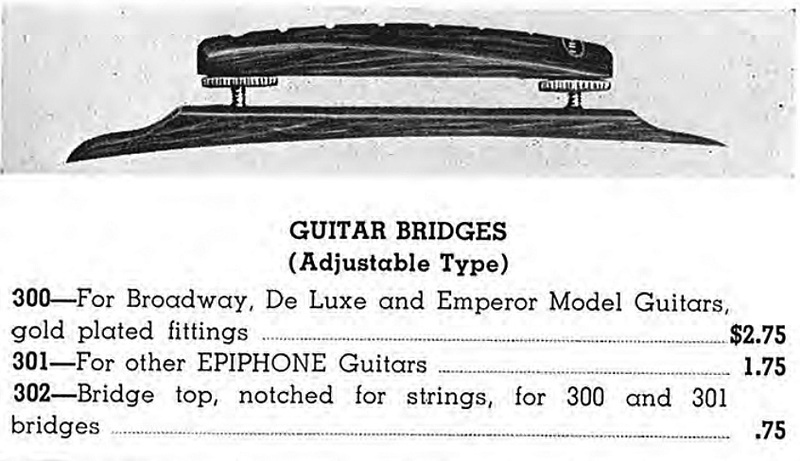 Epiphone floating bridges were identical in construction for all archtop models – except for the metal plating: nickel for lower models, gold for high-end instruments (see image above from the 1939 catalog). Tenor/plectrum guitars and mandolins: Bridges for 4-string guitars and mando family instruments followed the same construction principles as for 6-string guitars. Dating/originality caveat: Floating bridges are parts that are often modified or replaced during the lifetime of an instrument. Therefore it is common to see later replacement units or parts on earlier instruments. While many original bridges can be identified by the serial number under the foot of the base part, they still often survive with significant alterations – e.g. shaved down to allow for lower string action –, or fitted with a replacement top part which may be from Epiphone or a third party. Original bridges seen on the earliest Masterbilt models – referred to as "Type 1" in this text – show some unique features which differ from all later types: Firstly, the rosewood base part is cut out in the middle, forming two "feet" to "stand on" the guitar's top. Secondly, there is a bone saddle inset into the rosewood top part, notched for each string. The base forms a narrow ridge where the the bridge posts are placed; note that the posts are fully threaded. The thumbwheels show diamond pattern knurling, and are rather small in diameter. On some examples there is an additional square nut above or below the thumbwheels. By 1932 a new “Type 2” bridge was introduced, with several changes to the previous Type 1: Most significantly, the two-foot base was replaced by a solid structure, with a single "foot" shaped flush to the arched instrument top – a design that Epiphone would keep unchanged until 1956. 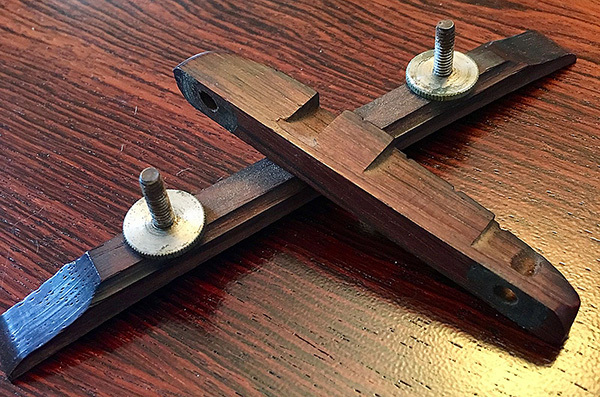 Furthermore, the rosewood bridge top no longer had a bone inset; instead the wood was beveled to a saddle with a slight angle for compensating string intonation. This saddle design became the established standard until around 1950. While the posts were still placed centered on a narrow ridge, their design was changed: The thumbwheels were now fixed to the posts which were only partially threaded – with a smooth tip holding the bridge top. By turning the thumbwheels, the entire posts moved up or down inside the round nut insets of the bridge base. Starting around late 1932, the instrument's serial number – and often also the model name – was inscribed in pencil under the bridge foot (as documented on several surviving examples). Around 1934 the bridge design underwent a minor modification: The bridge posts were now placed off-center in relation to the axis of the base – thus increasing the compensating angle of the saddle top. Note the placement of the inset nuts closer to the edges of the base – requiring a wider/flatter ridge. Otherwise this "Type 3" bridge was similar to Type 2. Beginning around late 1933, the serial number was now stamped under the bridge foot – on early examples still with penciled model name, see pictures below: Note the bridge post placement – still centered on SN 7047 (Type 2), off-center on SN 7738 (Type 3). 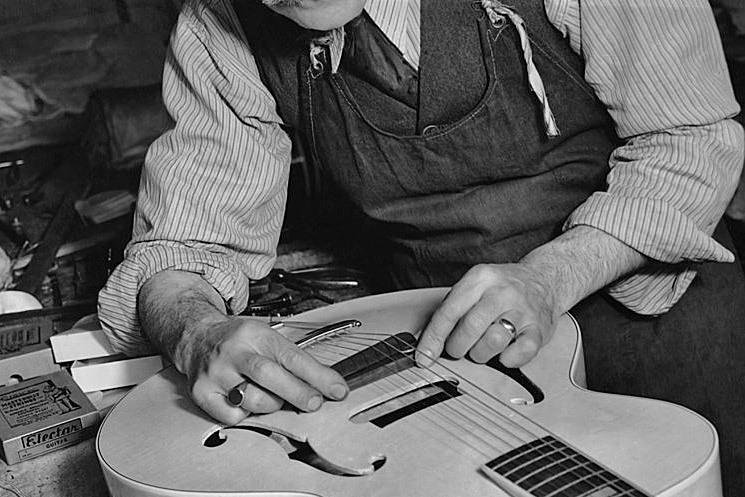 Stamping the serial number under the bridge foot of acoustic archtops (but not electric Spanish guitars) became a standard practice for Epiphone – until around 1950. The next change happened around 1937 with another redesign of the bridge posts: On "Type 4" bridges, the posts became fully threaded (again). The thumbwheels now functioned as nuts, moving up and down on the posts when turned – allowing for a wider adjustment range than with previous types. At the same time, the thumbwheels were slightly enlarged in diameter and now showed a straight knurling pattern. Note the pronounced off-center placement of the bridge posts and stamped serial number in the picture below. The introduction of “Type 5” bridges was prompted by WW2-related material restrictions: Due to the limited availability of metal products during the war, the thumbwheels were instead made of bakelite – although only for a short period in 1943. More commonly seen on wartime instruments are octagonal nuts made of thin metal – obviously requiring less material and machining than thicker, knurled thumbwheels. 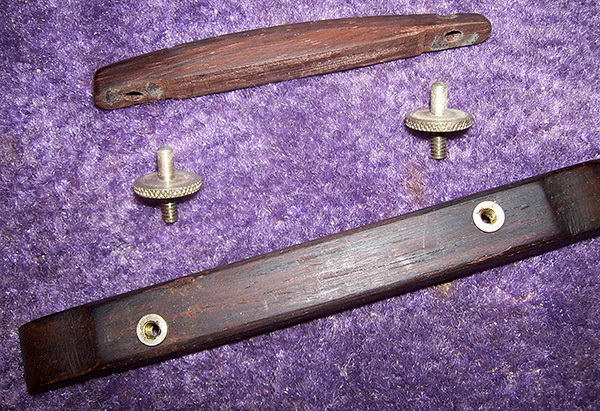 Note that these wartime thumbwheels had a larger diameter than prewar units, and some bridge bases for guitars with blond finish were made from a light-colored wood – two features that would carry over to the postwar "Type 6" bridges (see below). While original blond bridge bases can occasionally be found on earlier instruments (see above), they became a common feature after WW2. The wood used for the base was mostly maple. 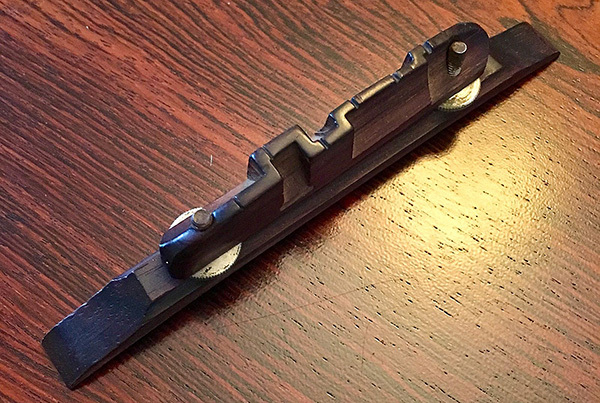 Interestingly, the bridge top always stayed rosewood. By 1945, round metal thumbwheels with straight knurling were reintroduced. On bridges of the post-war "Type 6", the thumbwheels had generally been further enlarged – possibly influenced by wartime units (see Type 5 above). As shown in the picture below, light-colored wood was occasionally stained to match the color of the instrument. 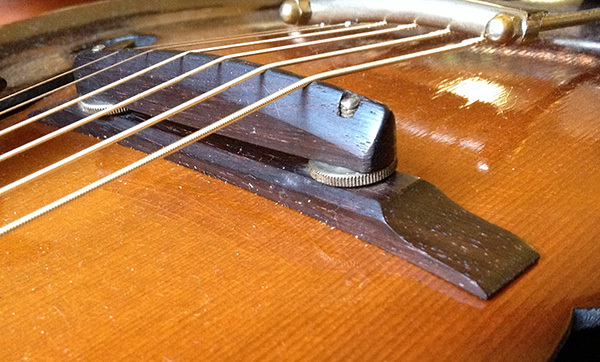 Blond bridge bases are commonly seen on acoustic and electric archtops with natural finish until around 1950. 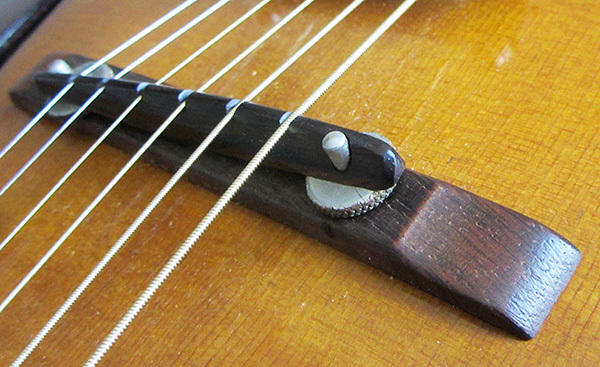 Around 1950, "Type 7" bridges started to become standard – first on higher-end acoustic and electric archtop models, by 1953 also on lower models. 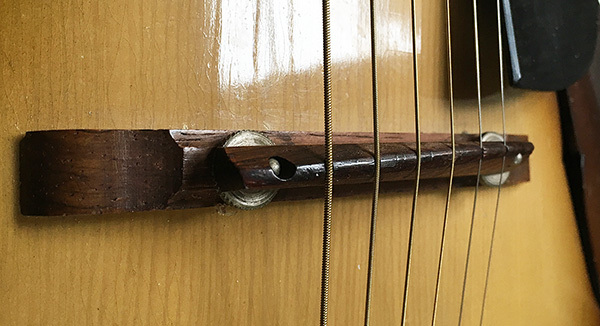 Their main feature was the "offset" bridge top, providing individual intonation compensation for each string – as opposed to previous style bridge tops which were angled but straight. While the large thumbwheels were adopted from Type 6, the posts now returned to a centered placement on the base, similar to the early 1930s. Note that by 1950 all bases were made of rosewood again. 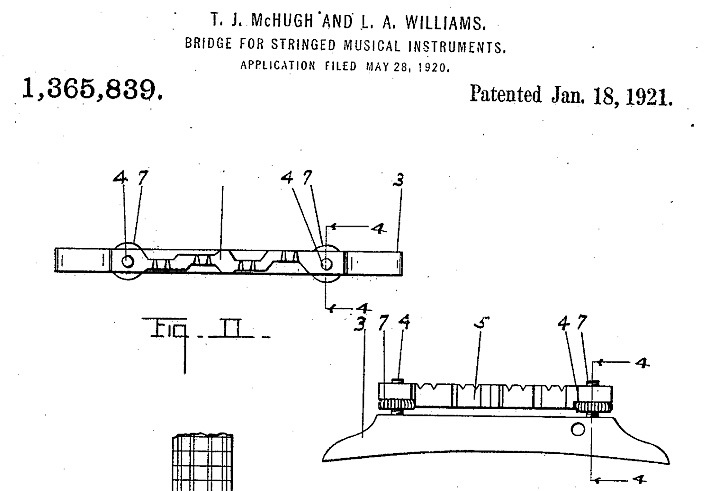 Stamped serial numbers under the bridge foot disappeared around the same time – making it impossible to determine if a bridge is factory-original to a guitar in question (even when of correct style). Apparently the transition to Type 7 bridges was rather slow – many Epiphone instruments from the '50s are are equipped with Type 6 style units. Interestingly, numerous earlier Epi archtops have surfaced equipped with an offset bridge top – does this mean replaced in the 1950s or later? Not necessarily: As early as in the February 1941 price list, Epiphone offered a product described as "No. 303 – Notched, offset type Bridge Top", alongside "No. 302 – Bridge Top" (see picture below). Obviously, the offset bridge top had been available as an optional add-on for a decade – before it was finally installed as standard equipment on new instruments.